Chicago, IL, April 19, 2012 --(PR.com)-- KM Fine Arts is pleased to announce the opening of PICASSO and BEYOND presenting 28 works from some of the most iconic 20th century artists who were instrumental, or participated in the infamous School of Paris: Pablo Picasso, Joan Miro, Marc Chagall, Hans Hofmann, Alexander Calder, Willem de Kooning, and Picasso’s lover, artistic muse, and painter Francoise Gilot, and figurative artist Fernando Botero. This period of art was predominantly figurative and expressive: the emphasis was on the experience of the immediate world around them and re-evoking this directly through paint. With a focus of conventional subjects, the School of Paris artists implemented diverse techniques and styles including the dynamic colors of Fauvism, the unprecedented methods of Cubism, the spirited qualities of Expressionism, and the intimate worlds of Symbolism. Even in his own lifetime Pablo Picasso was the most famous living artist. Nearly 40 years after his death, his fame is steadfast as his works are among the most collected in the world. For nearly 80 of his 91 years Picasso’s pioneering innovations, and the artistic production of an estimated 50,000 works. KM Fine Arts presents works from the artist's period of the 1930’s and his late period of canvas, india-ink on paper, etchings, linocuts, and ceramics. Although Picasso’s work of the early 1930s was dominated by images of his mistress Marie-Thérèse Walter, he also painted still-life and landscapes, including two views of this home at Juan-les-Pins. Picasso is not well known for his landscapes, however, despite his reputation as an "abstract" artist, his landscapes have a definite sense of place, more so than many photorealist-type landscape paintings. Picasso aimed to intensify experience by distortion, emphasis, even caricature. Maison à Juan Les Pins, 1931, oil on canvas is vintage Picasso with his mastery of and interest in depth. Another work included in PICASSO and BEYOND Mousquetaire, 1967 is an outstanding example of the many self-reflective portraits produced during his final years. Many works focused on the persona of the heroic male figure, as represented by the fisherman, the painter, matador, harlequin, and here the musketeer. In 1966 while convalescing in his home from surgery, his re-reading of Dumas’s French novel “The Three Musketeers” inspired Picasso’s use of the jaunty musketeer as an alter ego. Within a short time the musketeer had replaced the fisherman as the artists’ primary persona of choice. In his mid 80's and only six years from his death, Picasso had transformed himself into the virile, elegant, and adventurous character that offered an escape from his waning sexual powers and mere memories of his youth. This became a mask of sorts for Picasso during the remaining years of his life. Three Joan Miro color etchings from the 1960's, along with Untitled, 1981 ink, pencil, and watercolor on paper represents the artist's assemblage of styles he had been exposed during his time in Paris. Two Alexander Calder gouache on paper 1968 -1971 along with one sculpture Stabile, 1975 hang adjacent to Miro, whom Calder embraced a lilting line that could streamline forms from nature. Like Picasso, many of Calder’s works are made of one unbroken line or piece of metal. Hans Hofmann’s affinity with the School of Paris initially led to his popularity in the 1930’s. Several works by Hans Hofmann are presented from 1935 and 1940, including Landscape, 1940, casein on board. Similarities between Picasso and Willem de Kooning's lives are widely written. However, Picasso’s influence was unmistakable. Both endeavored to elude their high level of competence and training. Eluding that competence Picasso conceived cubism, de Kooning became a prominent influence to abstract expressionism. The artists’ Women series was a testament to Picasso’s influence. Two untitled charcoal works, one Untitled (Standing Woman), circa 1968-1970 are available as part of this exhibition. Another artist and work in this exhibition, Marc Chagall, a prominent figure in the School of Paris. Picasso had a great deal of respect for Marc Chagall’s ability with color and light. One such person whom Picasso expressed his admiration for Chagall was to Francoise Gilot, his lover and muse from 1944 to 1953. A respected painter, Gilot met Picasso at the time of her first exposition in Paris. 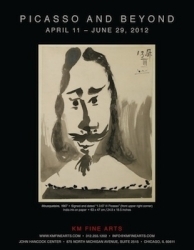 They have included only one cubist work in this exhibition, Gilot’s Cry of Orestes, 1967 oil on canvas. Gilot has expressed she felt Picasso’s cubism as a period of pure painting. The last three works included in PICASSO and BEYOND are by Latin American master Fernando Botero. Picasso had an unmistakable effect on Botero. A controversial high school newspaper article by Botero “Picasso and Non-Conformity in Art” had him expelled from school. Botero’s first works were highly influenced by Picasso then and as still today with his brothel scenes, ballerinas, self-portraits, and the guitar as in Picasso’s monumental work Three Musicians, 1921. They have included Fernando Botero’s The Three Musicians, 1990 sanguine on canvas, along with The Bedroom, 2010 oil on canvas, and a bronze sculpture Ballerina with Horizontal Leg, 2007. Picasso’s famously charismatic personality and his numerous mistresses filtered into his art but also may have directed its course. "For those who know how to read, I have painted my autobiography," -Pablo Picasso. And for those who cannot read, Picasso’s painting "Guernica 1937" exemplifies his worry about the death of reason and compassion in the world. A decade earlier, T S Eliot writes "The Wasteland" in 1922, considered by many, the greatest poem in the 20th century. Its message is more about the death of spirituality and social morals, however, both artists draw international attention to the universal message that wars and conflict have twisted the world. Picasso becomes the brush of "essay" of its day. Cubism abandoned Impressionism’s color and emotion, but as they drew away from this period the once collective efforts appeared to be a lost cause. The School of Paris artists each searched for individualism, yet unite as Modern-Style artists.